Indeed the celebration of the feast of St. Benedict in July was a memorable event for the monks of Hanga Abbey. 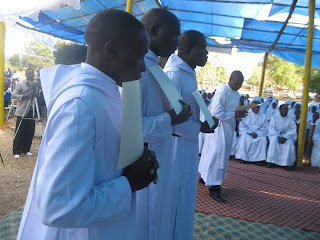 There was a big number of young men beginning their monastic formation and a large group of jubilarians among those in vows. On July 9th nine young men were admitted to the stage of postulancy, a largest group since 27 years ago when there were 20 postulants! This 20 postulant group is, ironically, the group that this year was making their 25th anniversary. They were 9 nine making their jubilee celebration. Better still three members made their solemn profession; two made their first profession, and two other renewed their vows. Also eight men were invested in novitiate. Above the new novices with Fr. Michael Mlowe, OSB, (center), the novice master. 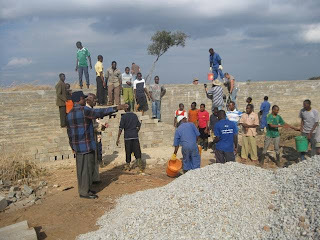 Topping on all these was a 50 year jubilarian Frater Gido Hyera, OSB, a famous carpenter at the abbey. Thanks be to God for the prayers answered!! 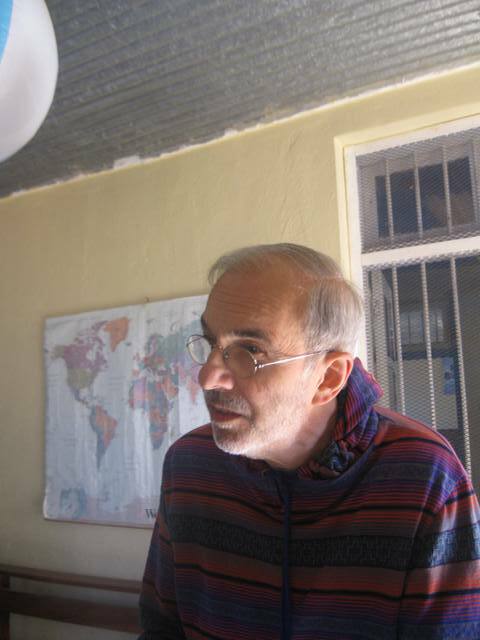 Above: Frater Gido Hyera, OSB, celebrated 50 years of monastic life. 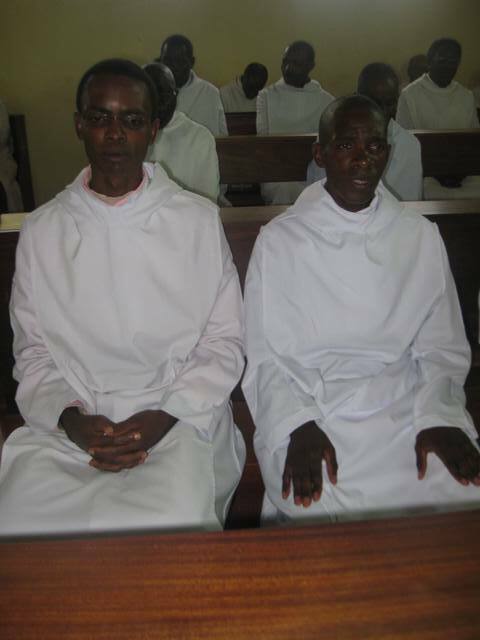 Above: Frater Rafael Mwanyika, OSB, left, and Frater Gonzanga Gonza Haule, made their first monastic professions. Below: standing are: Fraters Stanislaus, Amadeus, and Jacob who made their solemn profession. Nine monks celebrated their 25th anniversary of monastic life. 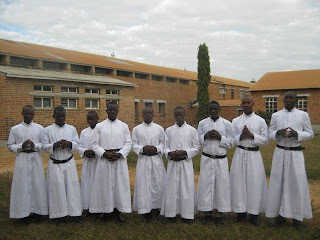 They were accompanied by abbot Denis Ndomba, OSB, of Mvimwa with whom they made formation and profession at Hanga but then he moved to Mvimwa abbey some years later after his profession. Above: the jubilarians; from left; Frater Gido Hyera, OSB, Frt. Cyprian Mgogo, OSB, Frt. Christopher Hunja, OSB, Frt. 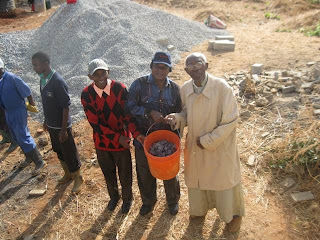 Sabas Mfikwa, OSB, Casmir Kadono, OSB, Frt. Buzabaliawo Kurwa, OSB, Frt. Alan Mahinya, OSB, Fr. Bruno Haule, OSB, and Fr. Serenus John Rupya, OSB. From left: Frater Gido Hyera, OSB, (50 years a a monk), Frt. Cyprian Mgogo, OSB, (living in Katibunga, Zambia) and Frt. Christopha Hunja, a laboratory technician at abbey health center. Fraters Fraternus (L) and Boniface renewed their monastic vows. 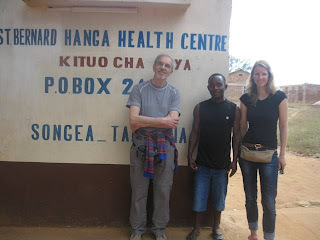 It was a joyous moment not for parting from each other but for the clear sign of friendship, good relationship and accomplishments in serving the needy in southern Tanzania for villages around Hanga Abbey. A farewell party took place at the abbey on the evening of July 6 to say goodbye to three groups. One group of eight people was from Austria led by Barbara had been coming to the abbey to experience African culture and the beautiful nature of Tanzania. Above visitors from USA and Austria at the farewell dinner. From right: Barbara (from Austria) delivering a spech. Next to her is Dr. David Thaemert from USA and M.D, Mario from Italy. Further below Dr. Mario is cutting a farewell cake. 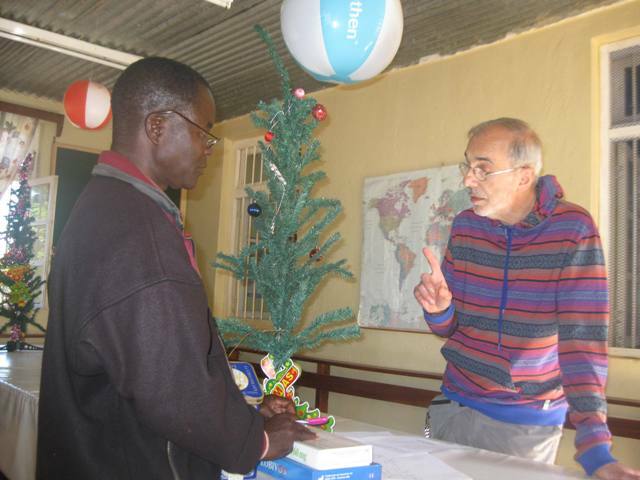 Another group led by Medical doctor Mario from Italy. Dr. Mario has been funding the abbey Health Center for many years and in many respects. He had three weeks stay at the abbey this time witnessing the progress of the construction of the surgery unit at the Health Center. 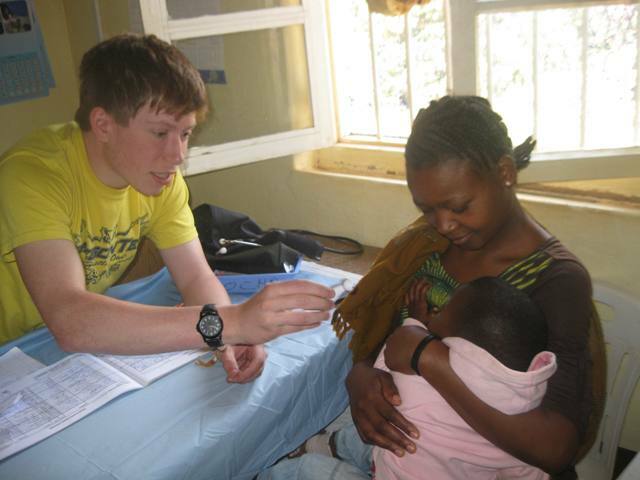 He is co-funding this consturction, and when it is finished it server particularly women with complications during labor and offer blood infusion service to anemic children. 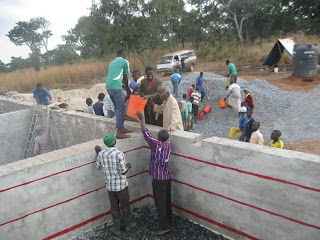 The third group led by Dr. David Thaemert from Oregon Institute of Technology, in Oregon, USA> had bee at the abbey for two weeks to built a structure that will help purify water fro the villagers areou Hanga Abbey. 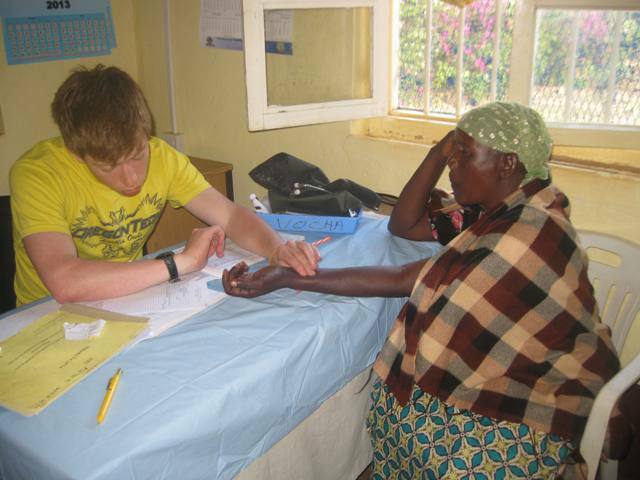 The group has been working on the project fro three years coming to Hanga every year for two weeks or so. During the meal Dr. David gave a gift of hats to all those who participated in the construction of the filter system. 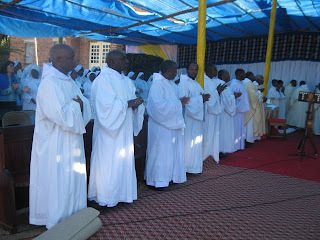 On the 25th of June 2013 Mvimwa Abbey, In Rukwa region, southwest Tanzania, a monastery founded by Hanga Abbey in 1979, had Fr. Denis Ndomba, OSB, elected as their second abbot after the resignation of abbot Basil Ngaponda, OSB, who reigned for twelve years. A man of great simplicity and humility abbot Denis was born in Mbinga diocese, southern Tanzania, on 22nd of July 1962. 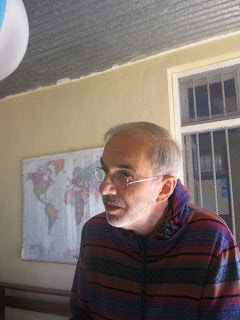 He made his first monastic vows on July 6, 1988 and was ordained to priesthood on July 13, 1997. He holds Masters Degree in Pastoral Counseling from the US. Following the election, abbot Dennis paid a short visit on July 6th at Hanga Abbey, where actually he had his formation as a novice before moving to Mvimwa. At the abbey he had the opportunity of presiding at mass and gave an address to the monks during meal at the abbey refectory. 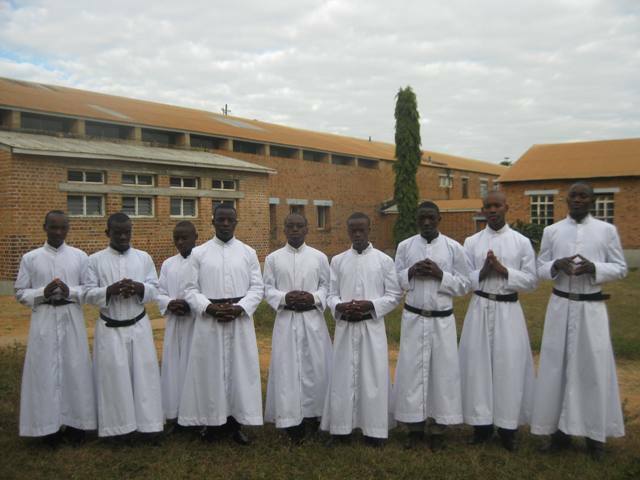 We wish abbot Denis success in leading the monks of Mvimwa abbey. Abott Denis with Frater Lucius Matembo, OSB, and with Fr. Gregory Mwageni, OSB, the first superior of Hanga monastery. still a struggle such awareness among the people is very important. Many children lack basic needs of life because parents really do not care or sometimes adults just think what they give to their children is enough though they could do more for the children. In the district of Namtumbo in Ruvuma region in southern Tanzania the African Child day this year 2013 was celebrated at Hanga Abbey. Different officials gave their speaches; but more time was aloted to children who performed drama, dancing and singing educating the community on the rights and needs of the children. Children at the celebration performing drama, singing and dancing to educate the community. 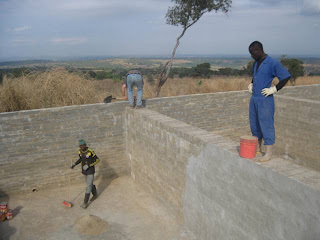 For five years now in roll students and professors from Oregon Institute of Technolgy (OIT), USA, have been working at Hanga and villages around Hanga Abbey to help people with getting clean water. 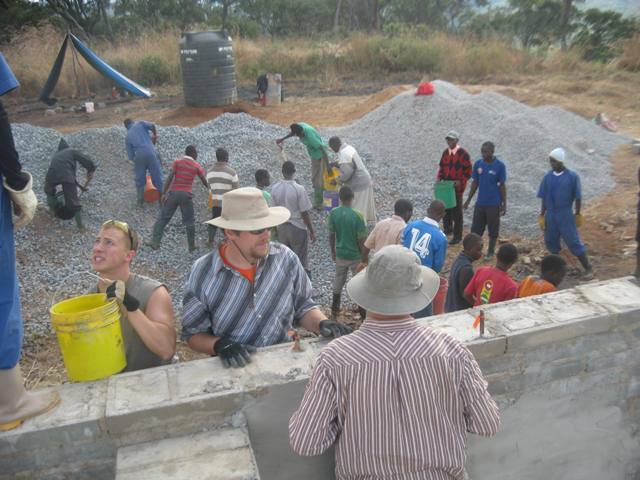 They work under the larger USA organization of Engineers Withoug Borders for some funding while the group raise funds for the project. This year from June 20 until July the work for the water filter system they have been construction in phase for three years. 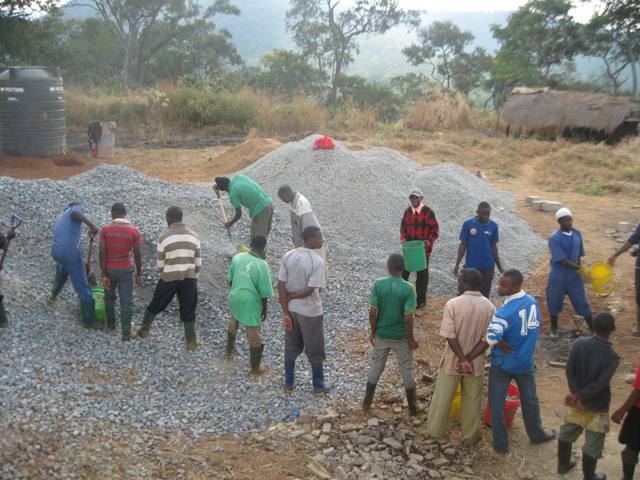 The phases has involved making a foundation, erecting wall, and now filling the tank with gravel and sand. Thanks to Dr. David Thaemert who has been leading the group for three years now after Dr. Mike Cornachione. 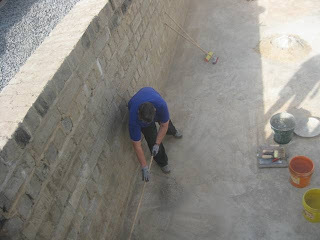 We present in this article pictures of working at the filter tank to fill in the tank with gravel and sand. Both the OIT group and monks of Hanga Abbey actively participated in the work. Coating the walls and floor of the filter with special coating material to prevent leakage. Even the old Fr. Gregory Mwageni, OSB, (below left) the first superior of Hanga Abbey has been at the site to give moral support. Prior Odo Nanyanje, OSB, and Frt. Lucius Matembo, OSB, are with him. We are happy to have volunteers at Hanga Health center most of the time. This June and July 2013 we have Medical Doctor Mario from Italy who stays until July 13. Dr. Mario has been a friend of Hanga Abbey for many years and has contributed a lot in the health service field. 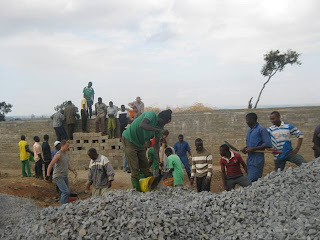 He helped the dispensary get an ambulance and now he is cofunding the construction of a surgery unit. We owe him a lot of gratitude. 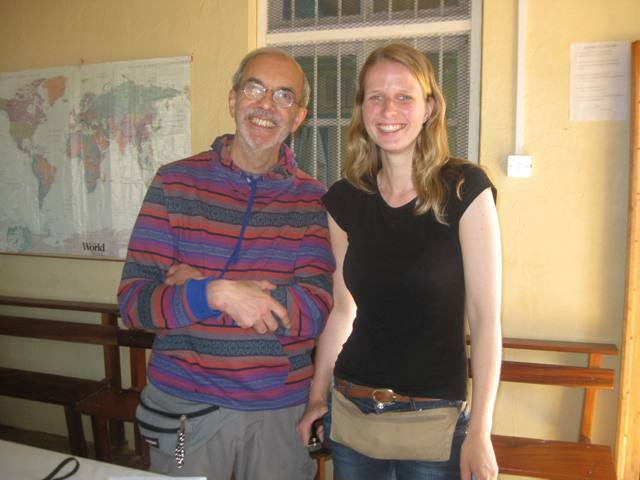 Dr. Mario with Ms. Nadine an Italian volunteer who volunteers at Chipole convent, two-hours-car drive southwest of Hanga Abbey. Below Dr. Mario is instructing a resident assistant MD at the Health Center. 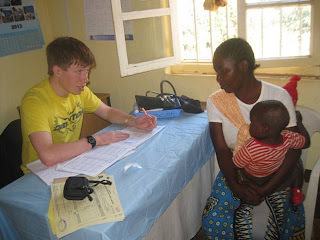 Another volunteer at the Health Center this time is Mr. Adam a student at Oregon Institute of Technology, in Oregon, USA. Adam accompanied other five members from the institute who work to build a water filtering system at Hanga. Adam and the the water group leave on July 7 for the US. 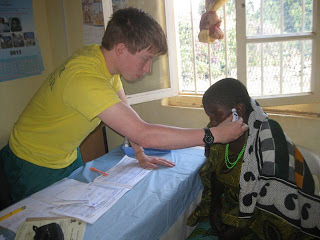 Thanks to Mr. Adam and his compatriots volunteering at Hanga. 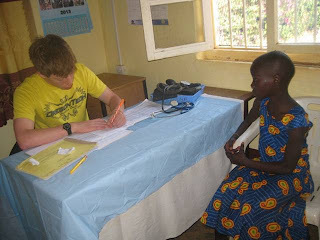 In the photos below Mr. Adam is attending patients at Hanga Health Center.